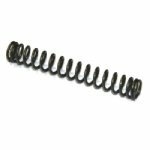 Brand new, genuine German HK production HK21E HK23E compression spring for slide or stud. HK21E: This is the compression spring for stud, part number 45 of illustration 9 of the HK21E spare parts catalogue. HK23E: This is the compression spring for guide pin, part number 33 of figure 9 of the HK23E spare parts catalogue.